Are you an avid crocheter who likes to crochet jewelry? Have you admired crochet jewelry for a long time and wanted to make some for yourself or others? I love to design and wear crochet jewelry! If you’re like me, you might be interested in a new crochet book I have by Annie’s. 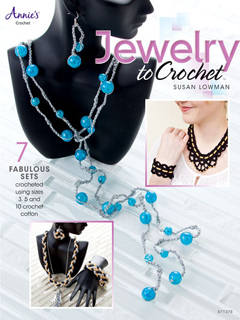 It’s called “Jewelry to Crochet” and it was just released for purchase last week. Included are 7 sets of jewelry, made with size 10, 5 or 3 cotton crochet thread, or with Kreinik metallic thread. Many of the sets also include beads. Each set includes a necklace, as well as a bracelet, earrings or both. I haven’t received my designer copies of this book, yet, so I don’t know how the inside looks. But I think they did a nice job with the photos! 1. It takes only a small amount of time to make a crochet necklace, pair of earrings and/or bracelet, so I get almost instant gratification! 2. I can make my crochet jewelry in any colors to coordinate with my various outfits. 3. Crochet jewelry doesn’t require much money in materials to make! 4. I love crocheting with thread and crochet jewelry is very conducive to thread crochet! 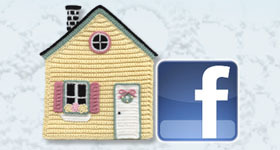 If you love crocheting jewelry, too, what are the reasons why you love it? I had a blast designing and crocheting these sets of crochet jewelry. I designed some of them years ago and others just last year. If you’re interested in crocheting some jewelry, you can read more about this book and purchase it on the Annie’s website. Why not crochet some jewelry today and wear it tomorrow? This entry was posted in Book review, Crochet jewelry, Crochet patterns, Designing, Thread crochet and tagged crochet book, crochet jewelry, crochet patterns, Designing, thread crochet. Bookmark the permalink.